Despite torrential rains earlier in the week that left parking lots waterlogged, the Philly Folk Fest is in full swing tonight. 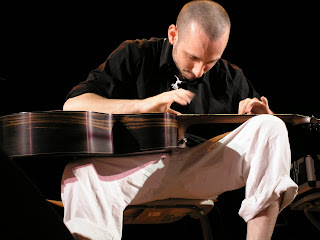 Guitar virtuoso Erik Mongrain strokes, strikes and strums his instrument to create sounds that most players never imagined were available from a wooden instrument with just six strings. The heavy rains rains earlier this week left the grounds so saturated that much of the main parking lot has been left unusable. Folk fans were frustrated by the delays last night. But volunteers have been shuttling campers and concert goers from the remote parking sites to the Festival grounds, and the hill looking over the main stage is filling up.